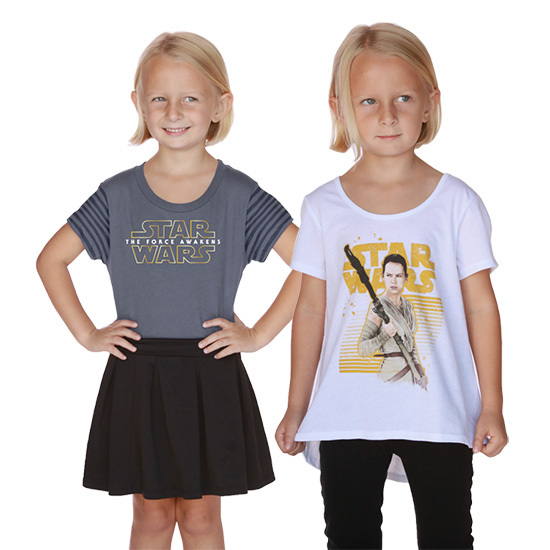 Home Brand	HER UNIVERSE DEBUTS NEW EXCLUSIVE HOLIDAY FANGIRL FASHIONS FROM STAR WARS AND MORE! HER UNIVERSE DEBUTS NEW EXCLUSIVE HOLIDAY FANGIRL FASHIONS FROM STAR WARS AND MORE! NEW YORK, NY – November 19th, 2015 – Shopping for a special fangirl this holiday season? Her Universe, the groundbreaking fangirl fashion company, has made your gift-giving a little easier this year with the debut today of dozens of exclusive fashions on heruniverse.com. These new fashion-forward designs, including cozy pullovers, jackets, dresses, fashion tops and more will please any Geek Girl for the holidays. Kicking off the festive shopping season are new designs available for the first time from Star Wars, Marvel, Doctor Who and Star Trek. In addition, Her Universe will continue its tradition by offering a free Star Wars holiday pin (and Ashley Eckstein autographed certificate) with every purchase of $25.00 or more starting on Black Friday. 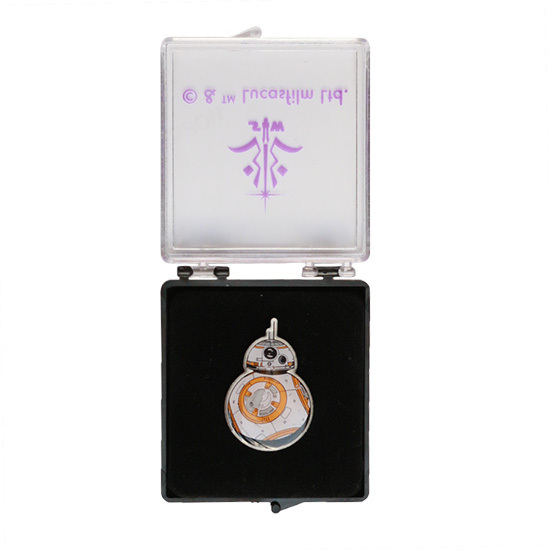 Rolling your way as the 2015 pin, just in time for Star Wars: The Force Awakens, is the lovable little droid, BB-8. The highly coveted pin (limited edition of 1,500) is available while supplies last. This free gift has a $30.00 retail value. Her Universe will be celebrating the holidays with special offers throughout November and December beginning with a holiday sale from November 26th through November 29th offering up to 60% off select items and free US Smart Post shipping on orders of $25.00 or more (through November 30th). On Cyber Monday five lucky customers placing an order that day will be randomly selected to receive a $100.00 Her Universe Gift Card. And to celebrate the return of Star Wars to the big screen with Star Wars: The Force Awakens, every order placed on December 18th (opening day of the film) will receive an exclusive BB-8 patch. The Force will be with Her Universe customers that day! All the exclusive holiday products kick-off today on HerUniverse.com. Give HER the Universe this holiday season with the Her Universe E-Gift Card! Her Universe continues its tradition by offering a free Star Wars holiday pin (and Ashley Eckstein autographed certificate) with every purchase of $25.00 or more starting on Black Friday. Rolling your way as the 2015 pin, just in time for Star Wars: The Force Awakens, is the lovable little droid, BB-8 (limited edition of 1,500 while supplies last). “Fa, la, la, la, la…May the Force Be With You!” This comfy Her Universe holiday sweater featuring our Star Wars heroes is, without a doubt, the holiday sweater you’ve been looking for! Watch other Star Wars fans eyes light up when they see you wearing this! Marvel fan? Her Universe has you covered! 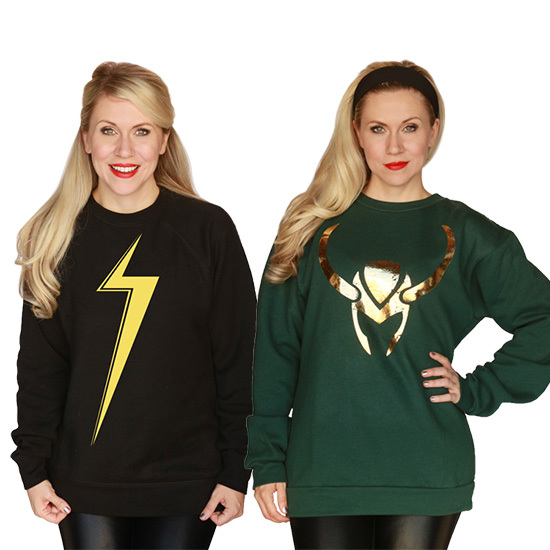 Above left: Channel your inner superhero when you wear this powerful Ms. Marvel sweatshirt from Her Universe featuring her lightning bolt logo. Empower your wardrobe day or night with this piece as it glows in the dark! Above right: Imagine being everyone’s favorite character from the magical realm of Asgard, but, beware, because this regal Loki sweater from Her Universe (printed in gold foil) may cause you to be mischievous! There is nothing more iconic in Star Trek imagery than the Delta Shield – Starfleet’s insignia. Her Universe has taken hundreds of tiny images of that symbol to create one large stunning Delta Shield on this cozy pullover. Printed in high density gold foil for a striking appearance, this piece of Star Trek apparel will Live Long and Prosper in your geeky wardrobe. 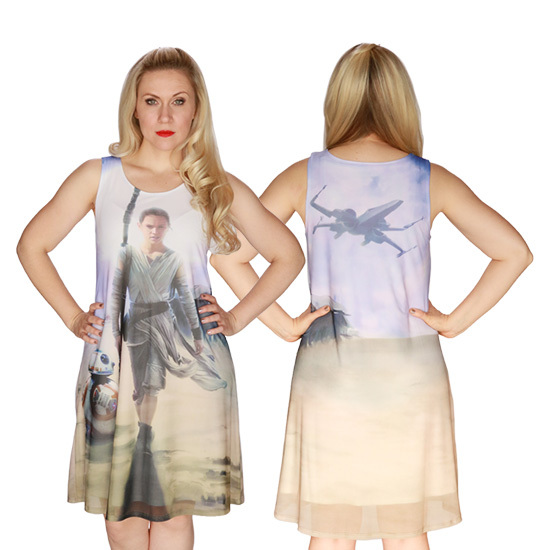 This beautiful new Star Wars: The Force Awakens swing dress from Her Universe features the resilient survivor and scavenger, Rey, with the trusty little droid, BB-8, as they trek through the harsh desert world of Jakku. Above left: Star Wars is for everyone and this stylish new striped Youth tee from Her Universe featuring The Force Awakens logo can be proudly worn by young girls everywhere showing their love for that galaxy far, far away! Above right: The Force Awakens on this new Youth baseball tee from Her Universe featuring the powerful image of Rey, played by actress Daisy Ridley, on the front. Clad in her distinctive metallic armor, Captain Phasma commands the First Order’s legions of troopers. 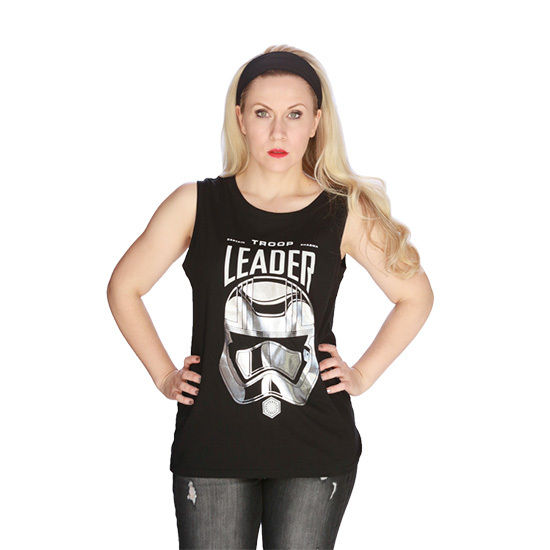 This new Force Awakens muscle tee from Her Universe features her stunning metallic helmet in silver foil and reflects the power of this imposing new dark side character. THIS is the dress you’re looking for! 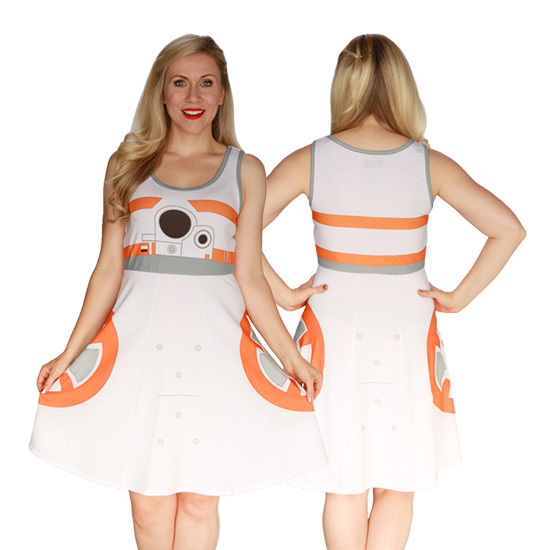 Awaken your wardrobe with this new stylish BB-8 A-Line dress from Her Universe featuring the little droid’s familiar markings . Be the envy of everyone on the block when you don this fashion piece reflecting The Force Awakens little ball of fun! Above left: When you’re a Time Lord two hearts are better than one! For the Doctor, his heart(s) are happiest at home in the TARDIS. 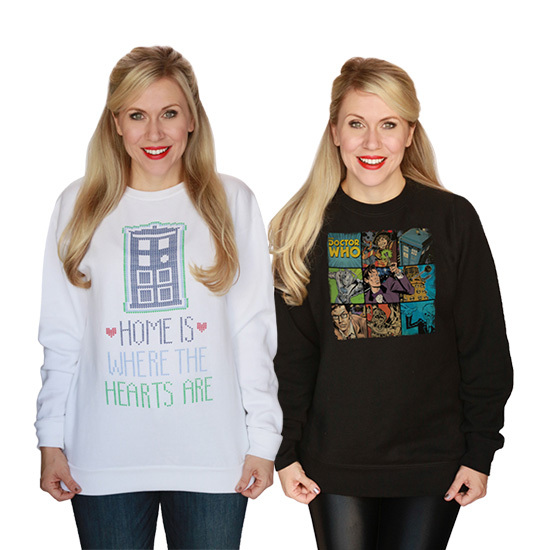 You’ll be happy, too, with this comfy new Doctor Who Pullover. Above right: The Doctor is in the house on this nifty and cozy block art pullover featuring vintage art of some of your favorite Time Lords, villains and, of course, the Doctor’s “House” – the TARDIS!